The 1991 Ryder Cup lives in history with the nickname "War By the Shore." Which tells you all you need to know about how contentious an affair this one was. The 1991 matches really set the more competitive, more contentious, more nervewracking tone that the modern Ryder Cup carries. The Americans, led by fired-up captain Dave Stockton, set the mood by posing for a military-inspired photo/poster, and some Team USA players showed up wearing battle-fatigues-inspired golf caps for Day 1 of the matches. The "war" rhetoric fanned the flames for some unfortunate fan behavior, Team Europe players claimed. The Americans said they were simply honoring troops taking part in Operation Desert Storm in the Persian Gulf region; the Europeans said some of the Americans' actions crossed the line from patriotism to jingoism. David Feherty and Nick Faldo got Europe off to a good start by winning their early matches. But the lead changed multiple times throughout the final day, a day whose tension is best described by the Mark Calcavecchia-Colin Montgomerie match. Calcavecchia took the match dormie after the 14th hole, 4-up with four to play. But Monty, playing in his first Ryder Cup, fought back. In truth, both played poorly over those last four holes, but Calc appeared a mess (some observers actually worried he might be having a nervous breakdown). Monty won the 15th and 16th hole, then gave Calcavecchia a chance to win it by hitting a ball into the water on the par-3 17th. Except that Calc then hit an even worse tee ball, very nearly a shank, that also went into the water only halfway to the green. Amazingly, Calcavecchia still had a chance to win the hole, but missed a 2-foot putt. Calc then bogied the 18th to lose another hole, giving Montgomerie the halve. Irwin struggled to get in the hole, Langer conceding him a short bogey putt. Which left Langer 45 feet from the cup with two putts to win. 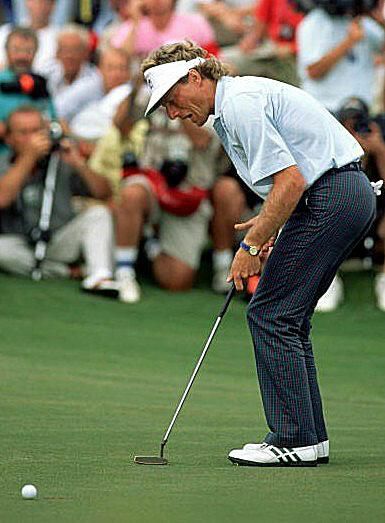 But Langer ran his first putt six feet past the hole, and then slid his par putt past the cup. A half-point for Team USA, a half-point for Team Europe - and a 14.5-13.5 victory for the Americans.  Sam Torrance/David Feherty, Europe, halved with Lanny Wadkins/Mark O'Meara, U.S.
 Seve Ballesteros/Jose Maria Olazabal, Europe, halved with Payne Stewart/Fred Couples, U.S.
 David Gilford, Europe, halved with Steve Pate, U.S.
 Colin Montgomerie, Europe, halved with Mark Calcavecchia, U.S.